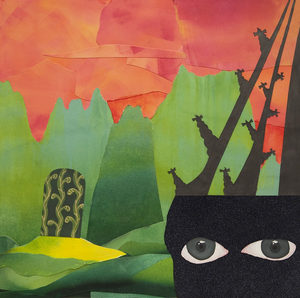 During the year that Alexandria Smith just completed as a visiting artist in printmaking at the University of Iowa, she was exposed to new printmaking techniques. These helped Smith refine her existing skills and gave her command of new methods she now incorporates into her practice. 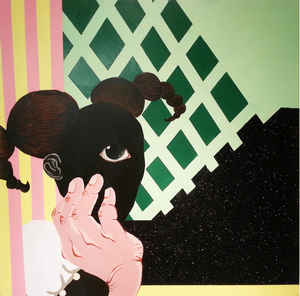 Based in Brooklyn, Smith uses the visual language of cartoons to express ideas about being a woman, about being African American and about everyone's quest for selfhood. Back in 2014, Smith mounted “Perpetual Adorations” at the Scaramouche Gallery, her first solo exhibition in New York City. It presented an insecure, young girl with thick pigtails named Marjorie. That character was a surrogate for the artist in her quirky development from child to adolescent to adult. 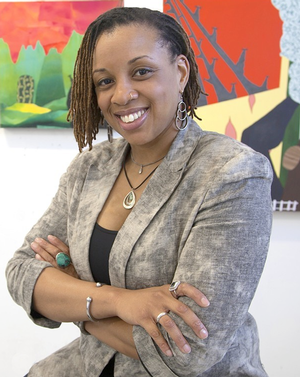 Alexandria Smith is among a plucky cadre of contemporary African American studio artists who’ve been inspired by styles and motifs of cartoon illustration. 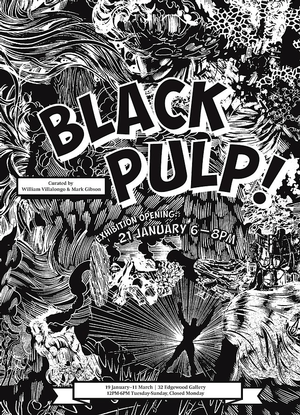 They include Deborah Grant, Kerry James Marshall, Laylah Ali, Trenton Doyle Hancock and William Villalongo who co-curated the Black Pulp! 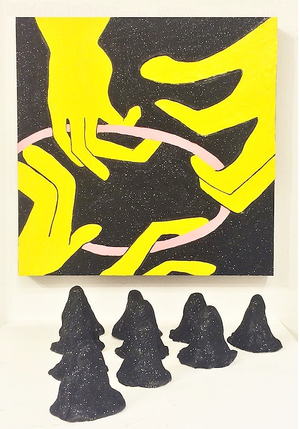 show at Yale University's 32 Edgewood Gallery (January 19 – March 11, 2016). 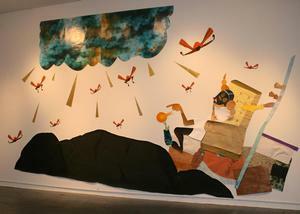 Alexandria Smith was represented in the show along with these and other artists. 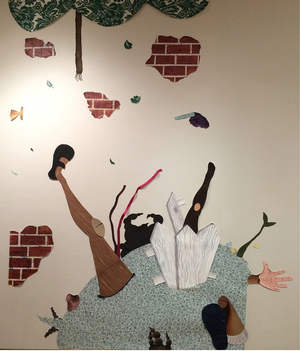 "Alexandria Smith traced the history of her work back to influences from her grandmother’s house in North Carolina. Her use of wallpaper designs, doily patterns, allusions to wooden floors and the ever-present pig-tail create an ever-expanding visual language that has informed her 2D and now 3D and performance-based work. Like many children being raised in New York City, Smith was sent to the south during the summer to escape the sweltering concrete. 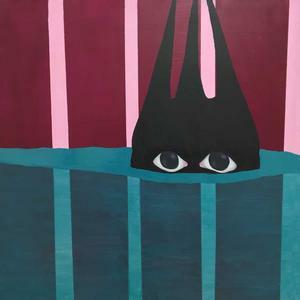 Her paintings and collages in some way recreate that space, while manufacturing a place where a young woman’s identity can be formulated, transformed and re-constructed." 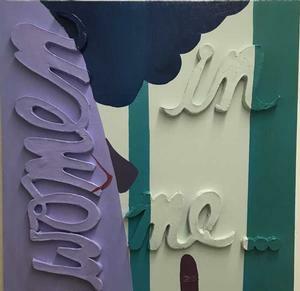 The Iowa fellowship provided Smith with a solo exhibition, All The Women In Me, that enabled her to realize installation ideas she had long been contemplating. 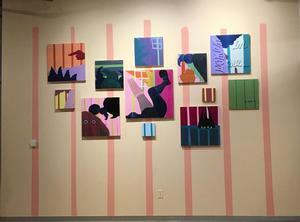 She exhibited a dozen new paintings salon-style on a painted wall that echoed some of the patterns and design elements in those works. For Smith — and for any artist — such a powerful response is like vitamins, minerals and sunshine. “This is the impact that I strive for. It's the reason why I make the art that I make and motivates me to go to the studio on the days when I am struggling,” says Smith. Cliff Hocker lives in Richmond VA.